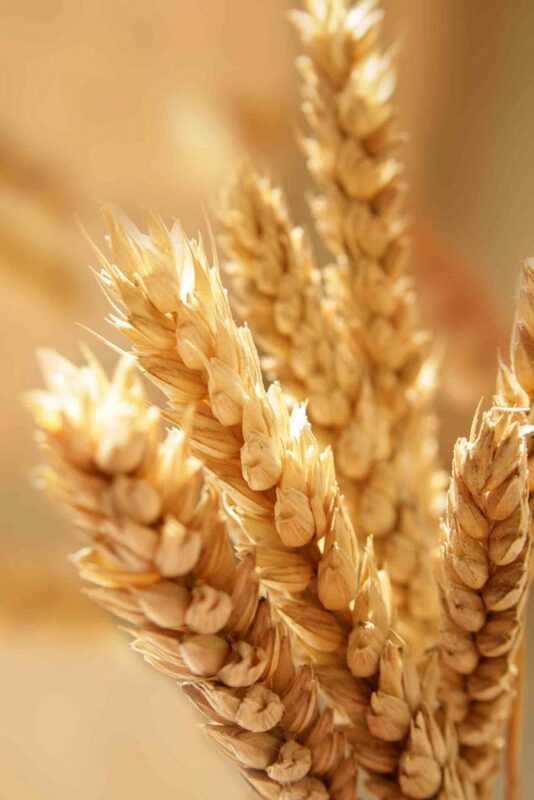 With over a million people in the UK opting for gluten free food now, Dr Harold Gaier (my naturopath) explains more about wheat, rye, barley and other glutenous grains. Rather than isolating gluten as the culprit, it’s the grain itself that can interfere with the way the body functions. Apart from the fact that wheat, rye, barley, etc are fermentable by yeasts (Candida and Geotrichum species) and by unwanted bacteria both of which can settle in the human gut[¹], there are other health aspects that I think are worth mentioning here. Much has been published concerning wheat: that it is a relatively recent component in our diet, consequently we have not yet properly adapted to it[²]; that it is the cause of Bakers’ dermatitis[³]; that it is a common food allergen; that neither our dentition nor our stomachs are like those of ruminants which consume such grains without problems; that it can be addictive; that the gluten and gliadin in it are associated with cœlic disease that affects some people; and that, together with sugar, it is one of the principal contributors to obesity. Yet what is not widely known is that each grain of wheat contains about one microgram (1 mcg) of Wheat Germ Agglutinin (WGA), which even in small quantities can have profoundly adverse effects in that it is immuno-toxic, pro-inflammatory, cardio-toxic and neuro-toxic. What is more, WGA can pass through the blood-brain barrier; WGA may, in certain circumstances, attach to the protective coatings of nerves (myelin sheaths); WGA inhibits nerve growth factor, which is important for the growth, maintenance and survival of neurons; WGA binds to the neurotransmitter N-Acetylglucosamine that operates in nocioceptive (pain) pathways. Here we have a list which, when taken together, means wheat may possibly contribute much towards the pain and suffering of arthritis and can (and does) contribute to other significant health problems. It is ironic, therefore, that wheat is one of the few foods for which, in most countries, food producers are permitted to make health claims on labels and packaging. This is particularly true of whole grains and bran where we can read, for example, that they reduce heart disease and certain cancers. Yet, in actuality, phytates (especially phytanic acid) are part of the fibre content of wheat. They are known to inhibit calcium, iron, zinc and almost certainly magnesium absorption, because of the formation of insoluble phytate salts. They get broken down in the leavening process when bread is made and do not then affect our mineral metabolism. But the whole grains that get added to ‘whole grain bread’ remain unaffected by the leavening process, hence they, precisely they – widely touted as “health-promoting”, contribute to the ill effects. Iron deficiency is one of the commonest deficiencies occurring in Europe. Wheat fibre, as we know, contains phytates which reduce iron absorption. Hence, unleavened bread, whole grains, bran and bran-based foods should not be consumed by those at risk of iron deficiency anæmia. Groups at risk include children under the age of two, menstruating women, and those who eat little meat, particularly, it seems, if they also drink tea. When one considers the evidence stacked up against wheat, it becomes clear that our super-abundant reliance on wheat and related grains (rye and barley) may be one of the primary culprits for the poor health of so many of us; and the explanation why anthropologists find traces of diseases like rheumatoid arthritis, heart disease, tooth decay, increase in infant deaths, diabetes, cancer, reduction of stature, increase in anæmia, diseased bones, a sharp increase in infectious diseases, a reduction in life span and many other serious illnesses archeologically recorded only after the historical introduction of these grains into the human diet. There is yet more bad news. WGA disrupts endocrine function contributing to weight-gain and insulin resistance by blocking the leptin receptor in your hypothalamus; and it interferes with the production of secretin from your pancreas, which leads to digestive problems and an unhealthy enlargement of the pancreas. Let me give you five more reasons why wheat and its fellow-travellers should be avoided: Wheat, rye, barley and soy contain exceptionally high levels of glutamic and aspartic acid making them all excitotoxic – this term describes a pathological process by which glutamic and aspartic acid cause an over-activation of human nerve cell receptors which may lead to calcium-induced nerve injury. WGA has been shown to be cytotoxic to cells (in joints, for instance) capable of inducing either cell cycle arrest or programmed cell death (apoptosis)[¹º]. WGA stimulates the biochemical construction of pro-inflammatory messengers called cytokines in intestinal and immune cells which play a causative role in a variety of chronic inflammations[¹¹]. Anti-WGA antibodies in human blood have been shown to cross-react with other proteins, persuasively suggesting that they may contribute to triggering auto-immunity[¹²]. WGA can cross your blood-brain barrier often pulling other substances with it, creating neurotoxic effects in your brain[¹³]. All of this can be ascribed to the fact that we humans have not yet adapted properly to wheat & co. This litany of adverse effects, now known to be due to this widely consumed anti-nutrient, might well be described poetically as “humanity’s bane from the wheaten grain”. Whoever said that only medicines affect our metabolism ? All grains contain a little WGA, but none as much as wheat, rye, barley and (to a lesser extent) oats. As you can see, if food can be your medicine, it can just as easily be your poison. Your severe joint pains and abdominal discomfort may simply be due to the fact that your constitution has adjusted much less adequately than that of others to the wheat grain. What to eat instead of wheat? Some starchy alternatives from around the world are: Sweet potato, white potato, cassava (also called yuka or manioc), sorghum, amaranth, buckwheat, millet, quinoa, sago, African yam, rice, maize (corn), gram flour, pea flour, chickpea flour, tapioca (prepared from cassava), Indian rice (also called water rice), water chestnut, salep, arrowroot, haricot beans, lentils, katakuri starch, chestnut purée, arracacha, breadfruit, acorn starch, favas, New Zealand yam (also called oka), taro corm, colocasia esculenta corm, eddoe (also called malanga), Japanese kuzuko, Polynesian arrowroot flour, kohlrabi, celeriac, swedes, and yellow or white-coloured beets. [¹] A Hunnisett, J Howard, & S Davies; Gut Fermentation (or the ‘Auto­brewery’) Syndrome: A New Clinical Test with Initial Observations and Discussion of Clinical and Biochemical Implications, J Nutr Med, 1990, 1:33­8.